Do you ever find yourself stood in the shower wondering what the atomic mass of Mercury is? 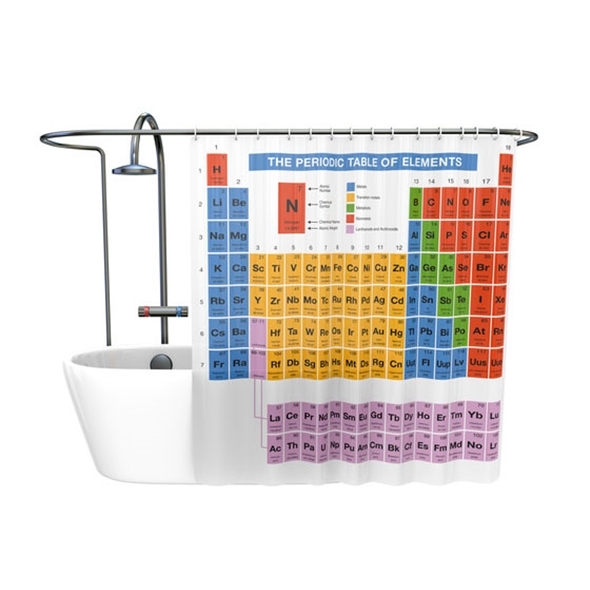 Neither have we, but now your able to find out, with the Periodic Shower Table Shower Curtain! This shower curtain is particularly handy if your studying for your science exam or you're just a keen science boffin. We all do weird stuff in the shower, whether that be pretending we're a profeesional singer or imagining we're under a tropical waterfall in one of those high street shower gel adverts, weird things happen in the shower. So learning about atomic masses and atomic numbers of elemnets won't look out the ordinary. Thats right! You can now learn all about elements whilst your getting your wash on in the shower with this Periodic table shower curtain. The shower curtain has all the elemnts from Hydrogen all the the way to Lawrencium. So instead of just standing there getting stupider, why not get your science on and learn all about the elements!